This was commissioned by and donated to East Surrey Hospital for their substantial renovation project in 2012. This painting can be found on permanent display in the A&E reception and is substantial in size. The idea behind the lighthouse is as a symbol of hope, steadfastness, security, safety, help at hand and the lighthouse itself was inspired by the old lighthouse at dungeness. Prints and cards can be found at Redbubble. Also commissioned and donated to the hospital is this painting of meadow flowers on canvas which hangs in the relatives' room. I've had to use this room in the past when my father passed away so I felt a connection with the sort of stresses and strains families are under when they are given this room to convalesce. 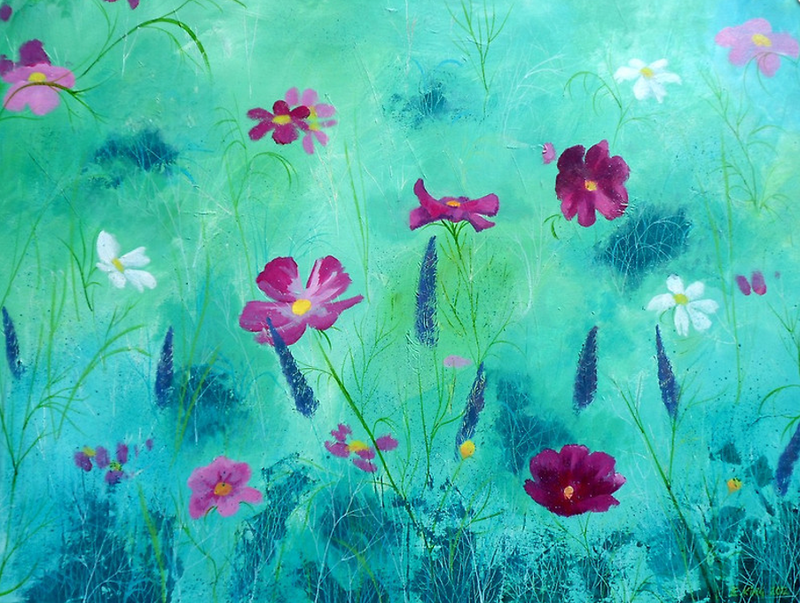 This painting was done in acrylics and it depicts a summer meadow packed with cosmos and lavender. It’s full of texture and small details of twigs, leaves and branches. The idea is that you can get lost in the painting as a way of meditation, reflection and even distraction from difficult times. Prints and cards and more can be found at Redbubble. "...The theme for these works was inspired by Indian textiles and incorporates the use of spicy, fiery colours: turmeric and paprika contrasting with the refreshing, cool colours of water and ice. Orange and blue are complementary colours just as refreshing drinks complement Ruchita's beautifully spiced cuisine. Pattern and design includes the use of well recognised motifs such as the 'buta' or tree of life, otherwise known in the UK as 'paisley' (adopted by textile manufacturers in Scotland)." "Ruchita meaning “well loved”, routed closely in the Sanskrit word Ruchikara which means ‘a taste for or penchant for, love of, appetite for’. 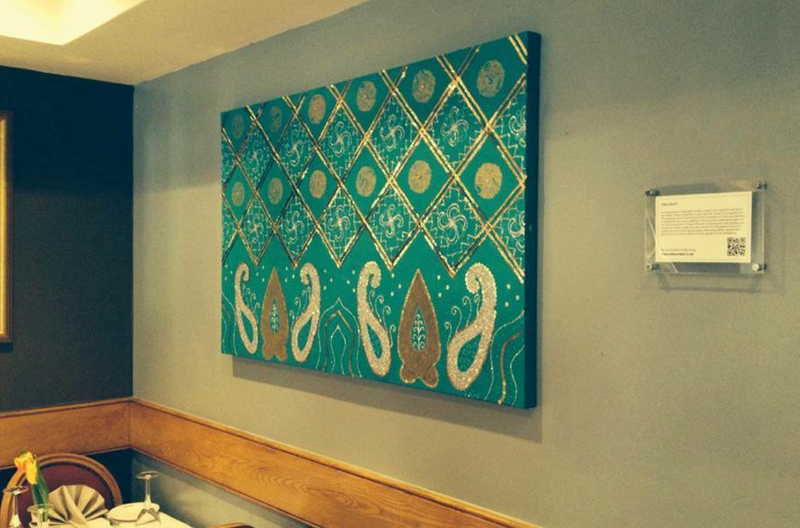 This painting, commissioned by Ruchita restaurant in 2014 is an addition to delighting the senses, revelling in the exquisite, celebrating taste and the love of good food. 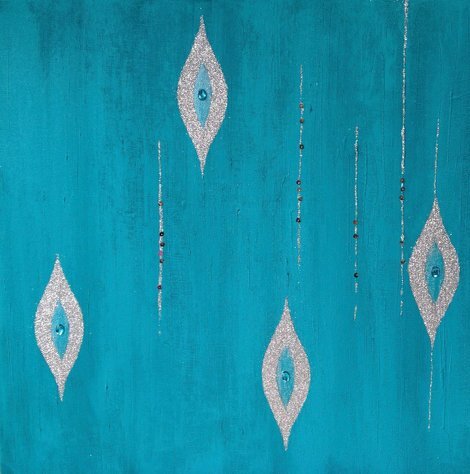 Design elements incorporated in this painting are inspired by Indian textiles and saris mostly from Bangladesh and incorporates the use of sand texture paste, embossing, glitter, sequins and gem stones to convey a sense of divine opulence and indulgence." One or two of these may be found on Redbubble for prints.